In addition to the rooms that have been restored to reflect various periods in Kensington's history, another series of rooms in Kensington Palace is used for exhibits about the modern royals. 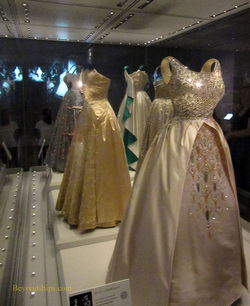 For example, in the exhibit “Fashion Rules,” the curators showed the relationship between fashion during the second half of the 20th century and gowns and dresses worn by the current Queen, Princess Margret and Princess Diana. The Round Pond seen from the Palace. When William and Mary purchased Nottingham House it was on the western edge of Hyde Park, a Deer park created by Henry VIII. Mary immediately created a garden next to the house. Feeling that the garden space was too small, Queen Anne annexed 30 acres of the neighboring park to the grounds of the house. But that was not enough for Queen Caroline who took another 300 acres. As a result, Kensington Palace today sits in a large park known as Kensington Gardens. Over the centuries, the park has been beautifully landscaped with water features such as the Round Pond and the Long Water, rows of trees and rolling meadows. In addition, several formal gardens have been created including the Sunken Garden (1908) next to the palace. There are various statues and memorials scattered around the park. Kensington Gardens is separated from today's Hyde Park by the Western Carriage Drive. However, the two parks blend together to form a giant green space in the heart of London. 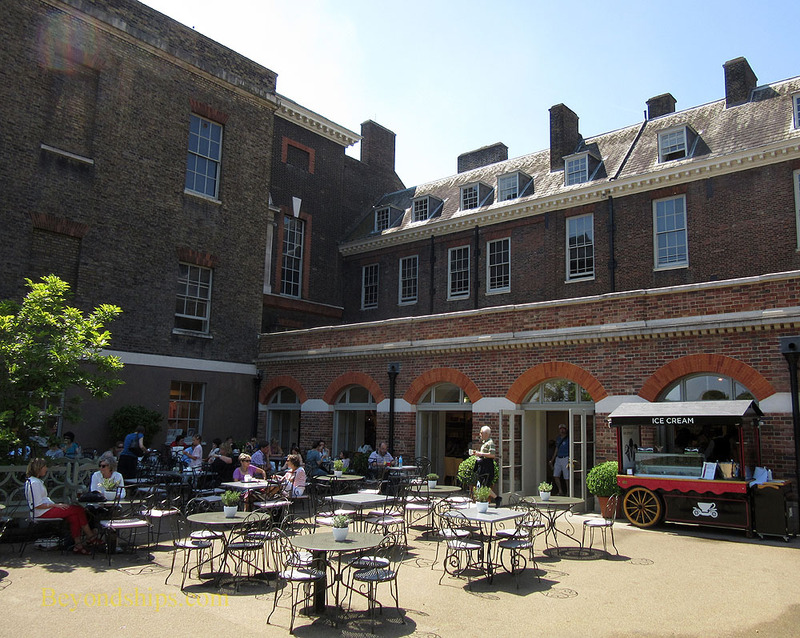 Kensington Palace is open daily except 24-26 December and 26-30 January. There is an admission charge for people 16 and older. Tickets can be purchased at the Palace, by telephone and online. The nearest underground station to the Palace is High Street Kensington, which can be reached via the Circle Line or the District Line. Inasmuch as the Palace is in the park, some walking is required. There is a Cafe with indoor and outdoor seating at the Palace. The Orangery also houses a restaurant. Above: The Sunken Garden was created in 1908. 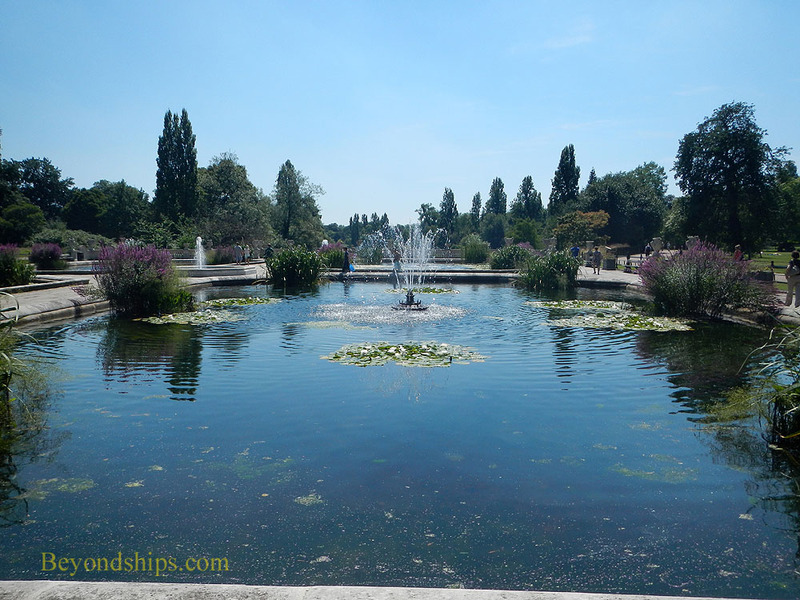 Below: The Italian Garden in Kensington Gardens.